We are IICRC Certified (Institute of Inspection, Cleaning and Restoration Certification) on both carpet cleaning and spot removal. 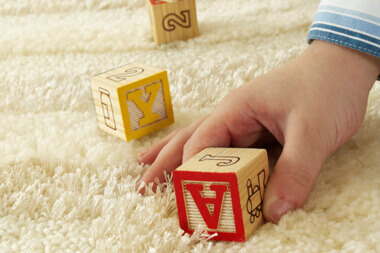 In addition to frequent vacuuming, its important to have your carpets professionally cleaned on a regular basis. Having your carpet clean will help remove the oily, sticky soil that vacuuming alone can't take out. Over time this will help keep the appearance of your carpet looking great. Having a cleaning schedule set in place before it gets unsightly, allows for an easier more successful cleaning chore. It is recommended by carpet manufactures that a typical Residential should have their carpets cleaned every 12 to 18 months, depending on the activity and number of residents. And that Commercial carpet cleaning should be cleaned at least very 3 to 6 months depending on the number of employees and activity with in the facility. Research indicates hot water extraction, or referred to as "steam-cleaning" proves the best capability of cleaning. With this system the process is applying a cleaning agent, raking or agitating the carpet pile, and using a hot water extractor to recover the used solution and soil. The truck mount allows us to only bringing into the home hose and a wand. Research shows that over the counter spotting products or do it yourself spot removal cleans poorly and their residues attract soil on the cleaned area rapidly afterwards. With proper identification we are able to use the correct spot removal that has Carpet and Rug Institute's Seal of Approval. And address the spot properly to try and help with its removal. Protection for Carpet and Upholstery. At Hands-On Cleaning we provide a discount to Veterans. Also, along with every carpet cleaning job our client receives a bottle of "Spot Out" with life time refill. Call us today for your carpet needs.